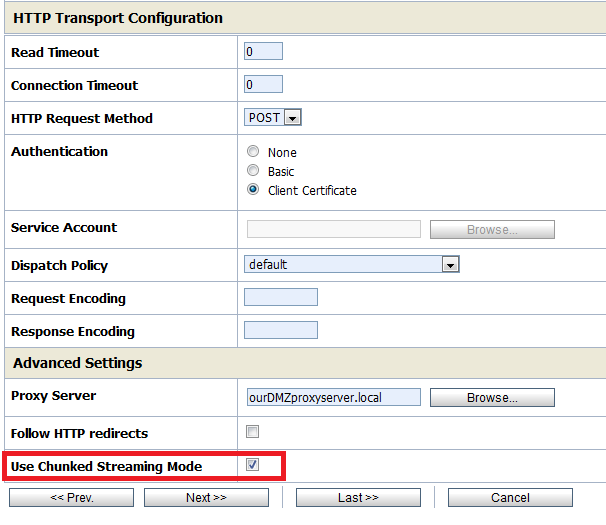 We are using Oracle Service Bus for SSL communication to an external party. Due to security regulations we use a proxy server configuration (note: not proxy service, but proxy server) on these specific business services. In computing buffer underrun or buffer underflow is a state occurring when a buffer used to communicate between two devices or processes is fed with data at a lower speed than the data is being read from it. This requires the program or device reading from the buffer to pause its processing while the buffer refills. This can cause undesired and sometimes serious side effects because the data being buffered is generally not suited to stop-start access of this kind. After enabling Weblogic SSL logging we see the below output (simplified) in the logfiles when sending a small message. The SSLEngine both shows wrap and unwrap methods. When sending a larger message the logging seems identical, however the logging stops after the outbound communication (wrap method) and no inbound traphic seems to return (unwrap method). Remember when we disable JSSE and use the Certicom implementation the process still works perfectly. So everything pointed to the direction of a combination: JSSE + large message = error. Sadly the .log and .out didn’t help in the problem solving here so experimenting with a few tuning parameters did the trick for us. After configuring the Business Service to use Chunked Streaming Mode the problem was solved and we again succeeded in sending out messages of multiple MB’s to our external trading partners. When I initially used Google and Oracle Knowledge base to look for the “BEA-000400 buffer underflow in doHandshake” error this was not very helpfull. So hopefully this blogpost is helpfull for others in the future when they have the same problem as us. in OSB: The invocation resulted in an error: General SSLEngine problem. I usually configure the keystore and truststore using the /console Managed Server configuration. But I guess this might get you there as well. :) Looking at the error my 1st guess would be your Weblogic connection doesn’t trust the endpoint. So you might wanna check your truststore.jks if all certificates from the other party are there. Including any Certifcate Authority or Intermediate certificate in that certificate chain. There was a bug in Weblogic. Patch 14255420: SU Patch [TJHY]: NPE IN JSSEFILTERIMPL DOHANDSHAKE solved this issue. I can see the handshake fails but don’t recognize why. Since you refer to using 2-way SSL. Did you In the OSB project: configure a Service Key Provider for SSL, connect SKP to Proxy on security tab, select client certificate on business service http tab ? You also tried the -Dweblogic.security.SSL.enable.renegotiation=true solution mentioned there ? Tested with SoapUI everything works like a charm. But with IIS it fails. Thank you for this great article. We had exact the same problem and could solve it with your help. This saved a lot of time.